The fair takes place at the exhibition centre of Fortezza da Basso in Florence whose very peculiar position of Fortezza da Basso, compared to the historical centre of Florence, makes it a very special location for visitors coming from outside of Florence and outside of Italy, since it is close both to the central station of Florence, Santa Maria Novella and the Amerigo Vespucci Airport. Spadolini Pavilion is the exhibition hall for Maredamare: an 11,000-square-meter area where both the fashion-show area and the exhibition spaces are arranged within a common setting. 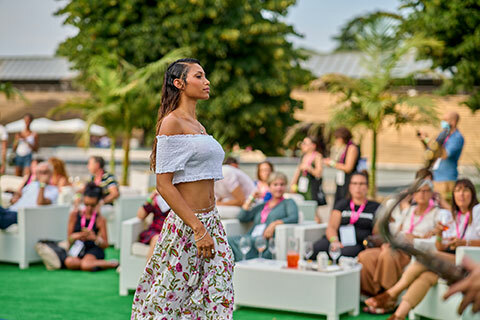 The Fair represents the meeting point between the top buyers and the most qualified companies, from the most famous brands to the new ones and it is the only Italian showcase to see the most important innovations that will characterize the beachwear collections of the coming year. ENTRANCE TO THE FAIR IS FREE OF CHARGE, UPON INVITATION AND FOR TRADE OPERATORS ONLY. On-line registration is required and a business card is requested at the fair reception where the catalogue will be delivered.